Before my trip this April, I thought I could count the popular Peruvian highlights on one hand: 1–Andes, 2–Machu Picchu, 3-Amazon, 4-guinea pig and 5-Nazca lines. Since I was already going to experience the first three, not interested in the fourth (note for non-regular readers: I am vegetarian) and couldn’t afford the fifth, I decided to give the lesser-known Peruvian desert a chance. Not to mention, after last year’s embarrassment royale during volcano boarding in Nicaragua, I wanted to prove to myself that I had become better at standing and sitting on planks. 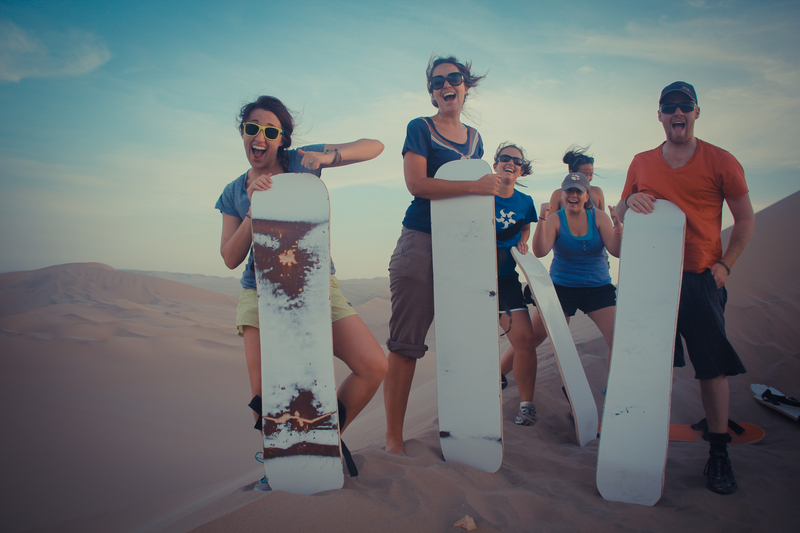 “Sandboarding sounds amazing!” I told my best friend who was living in Peru for a year (read about her Peruvian adventures here). 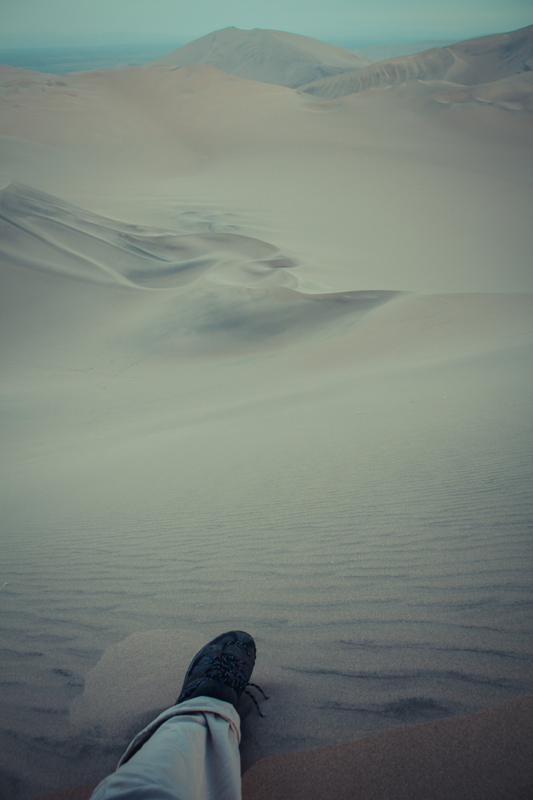 While I was discovering the mystical land of the Incas and realizing that couldn’t be more inaccurate in thinking that Peru only had a handful of major attractions, my friend organized our sandboarding adventure in Huacachina. 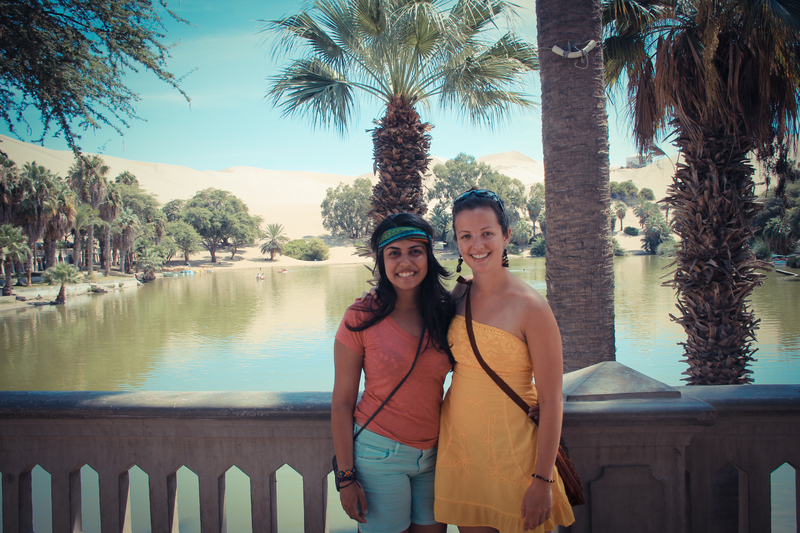 Huacachina is a tiny village in the Ica region. It is built around a small natural lake in the desert that is often referred as “the Oasis of America” by the locals. 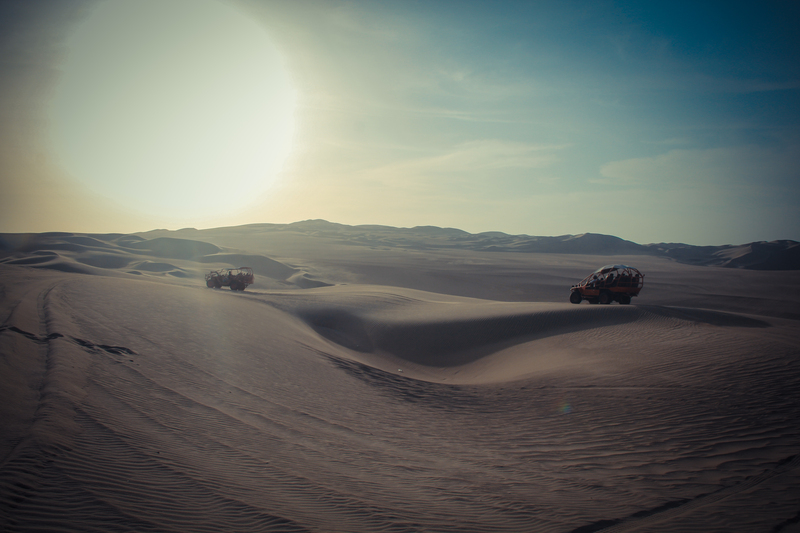 It is becoming an increasingly popular destination for young tourists because it serves as the base for sandboarding on the nearby dunes that are several hundred feet in height. Several restaurants and bars have sprung up around the oasis to feed the tired (and sandy) adventure-seekers. We were a group of seven that perfectly fit the aforementioned young, adventure-seeking tourist profile. The best time to do the sandboarding tour in Ica is sunset so that you don’t get burnt by the desert sun and also the sand is cooler. So, late evening we all geared up in our least favourite outfits and packed into a dune buggy. I had initially thought of the dune buggy solely as a mode of transport to get to the sand dunes, but it ended up being a case of “the journey is more memorable than the destination.” Our dune buggy driver was a little daredevil who sped to the top of sand dunes and let the buggy fall sharply many times, giving us the right adrenaline pump we needed before something like sandboarding. If you are a snowboarder (or an amateur one like myself), there are only a few baby slopes you can sandboard properly. After you’ve gotten a hang of the modest dunes, the tour guide takes you to the real deal: sharply vertical, dangerously steep and taller than I had bargained for. It is advised that you go down these laying flat on your stomach to catch maximum speed and maintain the best balance. One by one, almost everyone in my group made their way down with a massive wooohooo and our tour guide gave me a stern “Vamos chica” so despite my inherent fear of slopes and heights, I stiffly hung on to the board and waited for him to push me down. I can’t think of a poetic way of saying “It was so much fun!” because simply put, that’s what it was. It was the perfect speed, I was able to manouver myself and slow down when I needed to. Best of all: I didn’t take a massive tumble at any point. Hurray to that! 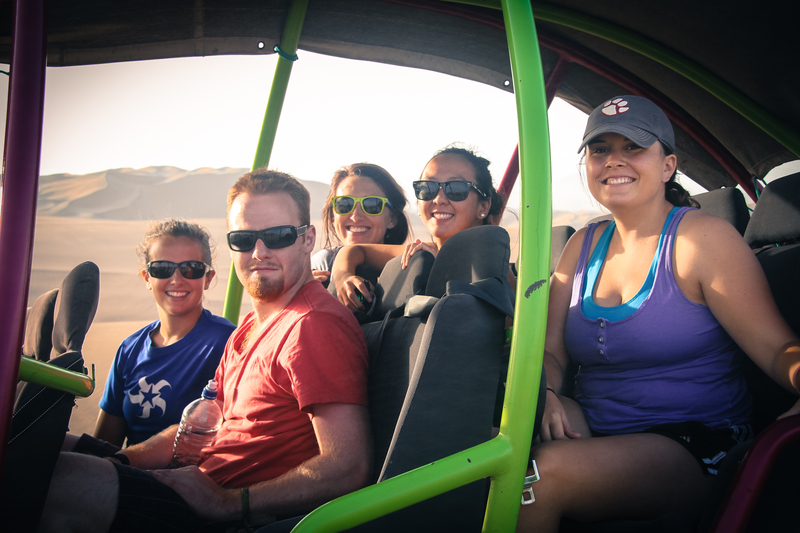 By the time we piled back into the dune buggy to head back to the hostel, there was sand in our teeth, ears, hair, clothes, camera bag, shoes, socks… you name it! But who really cares about being uncomfortable and eating dirt when you are sitting in an awesome dune buggy, driving into the sunset?